The glorious history of the erstwhile state of Kapurthala not only speaks of its majestic buildings and palaces but also of a rich music tradition. 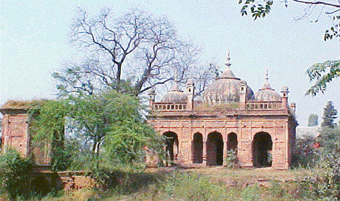 This famous legacy, which was conceived by Mir Nasir Ahmad, a descendant of none other than Mian Tansen, has, however, passed into obscurity with time, writes Aditi Tandon. AS you drive past the neatly laid out streets of princely Kapurthala, the dusty winds produce music of their own. They divert your attention from the majestic buildings to a melodic charm that seems to have a strange hold on the city’s soul. Scratching history for details, you realise that the state is not just about the royal France look or the Jagatjit Palace, a remarkable tribute to Louis XIV, but also about a glorious musical legacy, conceived and nurtured by Mir Nasir Ahmad, a descendant of Mian Tansen. Moving into the interiors of the city, you find the mazar of Mir Nasir Ahmad, who established Punjab’s vital connection with the Senia-Beenkar tradition that was mastered by Tansen. Although there is little documentation to systematically lead us through the development of the Kapurthala music tradition or the process of its dilution following Partition, one uncontested fact is that Mir Nasir Ahmad, who was brought to Kapurthala from the court of Bahadur Shah Zafar by Kanwar Bikrama Singh of Kapurtahala, was the founder of the Kapurthala music tradition, which originated somewhere around 1858 AD. If the Janmasakhis are any indication, Kapurthala also had a rich rababi tradition. It is said that Guru Nanak Dev commissioned Bhai Firanda, a famous musician from Kapurthala, to create a special rabab for him, which could withstand the rigours of udasis, his religious voyages. 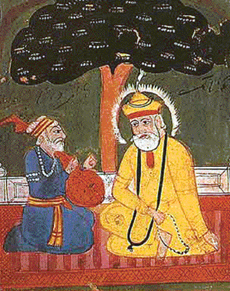 Janmasakhi accounts, housed in museums across Punjab, also hint that Guru Nanak’s disciple Bhai Mardana could well have been taught the rabab by Bhai Firanda of Kapurthala. Punjab has given some matchless ragas to the Indian classical music. Anita Singh, by virtue of her access to historical information regarding the progression of Punjab’s traditions, says ragas like "Kasuri Bhairavi, Sindhura, Multani (by sufi mystic Sheikh Bahauddin Zakaria), Jaijaiwanti (from Kohwari, a Sindh folk tune), Jogiya, Asa, Kafi, Pahari, Sorath and Varhans" have been Punjab’s contributions. Among the oldest music festivals of India is the Harballabh Sangeet Sammelan, which has been held for over 127 years now. Pt Vishnu Digambar Paluskar founded a premier classical music institute called the Gandharva Mahavidyalaya in Lahore in 1901. Mian Ghulam Nabi Shori composed tappa, on of the most difficult classical forms, in Punjab. The vichitra been, a foremost musical instrument, was also evolved here by Mian Abdul Aziz. The greatest tribute to Punjabi khayal is that Shah Sada Rang and Shah Ada Rang (once royal musicians in the court of Muhammad Shah Rangeela) have composed khayal bandishes in Punjab. And, perhaps, Punjabi is the only language apart from Braj in which bandishes have been composed and sung for the last 200 years. But even before the pure classical tradition began to flourish in the state under the royal patronage of Kanwar Bikrama Singh and Raja Sir Daljit Singh, other genres of music were already flourishing on the soil of this royal city. Since Kapurthala was on the national highway to Lahore, it attracted practitioners of sufiana style such as Saeen Ilyas. A great Sufi and dhrupad maestro, Saeen Ilyas tutored a celebrated set of disciples, who branched out to take the sufiana qalaam not only to various parts of India but also to locations across the seven seas. These include France, which still houses the Sufi Centre founded by Sufi musician Inayat Khan, who was instructed in the Saeen Ilyas’ school of music. It is imperative to mention here that Inayat Khan, who married an American named Ora Ray Baker, went on to pass the sufiana tradition to his daughter Noor Inayat, an illustrious singer herself. Noor later joined the British Secret Service. Attributing her patriotic inclination to the sufiana musical tradition she inherited from her father, Noor rechristened herself Madeliene for the service. She later went on to create trouble for Hitler by spying on the German forces. Caught for espionage against Germany, Noor Inayat, alias Madeliene, alias Mata Hari, was shot dead by German troops on September 23, 1944, while World War II was still on. The interesting part of Noor’s life is her connection with Punjab, especially Kapurthala, which was home to her father’s great guru, Saeen Ilyas. A search for Kapurthala’s music tradition leads us to various corners of the city. Unfortunately, its residents remain oblivious to its invaluable heritage, both architectural and musical. A visit to the tomb of Mir Nasir Ahmad proves to be an exercise in futility and anguish. Lying in a state of abandon for years, the tomb of the great musician doesn’t make music any more. As attempts to decipher faint Urdu inscriptions on the tomb’s façade also fail, you prepare to return through the dense, wild growth — the only company the descendant of Tansen has today. Away from Nasir Ahmad’s tomb, some information about his musical style and his priceless contribution to the Kapurthala music tradition begins to flow. The most authentic source for details on the city’s musical journey is Anita Singh, member of the Kapurthala royal family. She along with her cousin, Maharaja of Kapurthala, Brig Sukhjit Singh, has assumed the responsibility of reviving the lost cultural might of this historical city. She recently organised an elaborate three-day music festival at Kapurthala, with the twin objective of promoting the city as a tourist destination and also commemorating the memory of Baba Jassa Singh Ahluwalia, the warrior king who gave Kapurthala a definite edge over the other princely states of Punjab. Few know that Jassa Singh, the founder of Kapurthala, was himself a musician, trained in the recital of gurbani and kirtan. One of the books that provides lucid information about Kapurthala mentions a particular incident, which suggests that Jassa Singh, as a child, once sang gurbani in the presence of Guru Gobind Singh’s wife Mata Sundari. The latter, overwhelmed by the child’s talent, lifted him to her lap and caressed him. Music continued to have a place of prominence in Jassa Singh’s daily schedule, which is elaborated in another book hence: "At daybreak, he would rise, perform his ablutions, repeating the morning prayer or Sukhmani. After the evening meal, musicians played and sung the Rehras or the evening prayers." Connecting sequences of the musical progression of Kapurthala, Anita Singh, also Director, Indian Music Society in New Delhi, discloses interesting bits of information about the tradition’s inception. "The known tradition began in 1858 when Nasir Ahmad, a descendant of Mian Tansen, was brought to Kapurthala by Kanwar Bikrama Singh. Tansen’s daughter was married to a Mir of aristocratic lineage, whose son Mir Nasir Ahmad was a nobleman in the court of Bahadur Shah Zafar. Nasir Ahmad had received musical training from his grandfather, who instructed him in the nuances of the Senia-Beenkar Gharana. It is said that when Bahadur Shah Zafar and his senior courtiers were being sent to exile, Nasir Ahmad was also taken along because he was sporting a dastaar (turban) which only the noblemen of the court were permitted to wear. This was when Kanwar Bikrama Singh of Kapurthala state intervened and gave a personal guarantee to the then Governor-General John Lawrence that Mir Nasir Ahmad was a musician and was, therefore, no threat to the Raj. That was how Mir Nasir Ahmad was spared and brought to Kapurthala by Kanwar Bikrama Singh. Nasir Ahmad lived in Kapurthala for the rest of his life. His mazar lies in the heart of the princely state. His two sons, Mir Kallan and Mir Rehmat Ali, became distinguished musicians of their times. They also played the been and sursingar. This is how the instrumental nuances and the musical techniques of the Senia Beenkar Gharana of Tansen came to Punjab through Kapurthala." The treasures of the Kapurthala music tradition were further enriched when Mir Rehmat Ali, after seeking permission from Raja Sir Daljit Singh of Kapurthala, went to Calcutta to learn music from Ali Mohammad (a direct descendant of Tansen). He returned to Kapurthala to enhance the prevalent style. Another very interesting story is that of one Rehmat Khan, a musician from Sialkot, who had been trained in music under the tutelage of Saeen Ilyas of Kapurthala. Few know that Rehmat Khan, who migrated from Sialkot to Baroda due to some personal exigencies, was to become the catalyst for propagation of the Kapurthala music tradition, both sufiana and classical, in India and abroad. Musicologist and traditionalist Pandit Yashpaul, a renowned performing artiste from the Agra Gharana, brings forth vital links in the story which speak of how the Kapurthala music tradition, through Rehmat Khan, first travelled to the royal palace of Baroda and from there entered alien soils, beginning with France. "I have some authentic information on Kapurthala’s music tradition and its propagation, by virtue of my association with renowned vocalist Bhagwan Das Saini, trained in the Kapurthala music tradition. It was Bhagwan Das Saini who told us about one Heme Khan, another celebrated musician from the Kapurthala tradition. Heme Khan was a student of Saeen Ilyas, the dhrupad maestro who was a direct descendant of Suraj Khan and Chand Khan, royal musicians of Mughal Emperor Akbar." Going back to his notes, which he habitually took whenever great maestros shared experiences with him, Pt Yashpaul came up with an illuminating tale of the merger of the Baroda and Kapurthala traditions. "During the time when the Kapurthala tradition was flourishing, a famed musician called Maula Baksh (who is also considered the father of the Indian notation system) was the royal singer in Baroda. He had two wives: the first named Qasim Bi was Tipu Sultan’s daughter; the second named Amir Bi was a convert. This time around, Rehmat Khan was emerging as an asset to the Kapurthala music tradition, which bore both sufi as well as classical influences. There is published text to indicate the migration of Rehmat Khan, a disciple of Saeen Ilyas, from Sialkot to Baroda. In Baroda, Rehmat Khan married Khatija Bi, the daughter of Maula Baksh, a royal musician. This grand merger of two prominent gharanas of those times was a significant event in the history of both gharanas, especially the Kapurthala tradition, which, through Rehmat Khan, was to travel to France and other locations outside the country." Among the few sources of information available on Rehmat Khan, whose son Inayat Khan later took Kapurthala’s and Saeen Ilyas’ Sufi tradition all over the world is an old book, titled Minqar-e-Mausiqui. Interestingly, the Sufi Centre in Delhi had once requested Chandigarh-based Pt Yashpaul to translate it from Urdu into English. The task could not be accomplished due to some problems. Pt Yashpaul still possesses this book, which has details about Inayat Khan, who married a Christian lady named Ora Ray Baker. After the birth of a daughter, Noor Inayat in Russia, Inayat Khan returned to France, where he established the Sufi Centre. 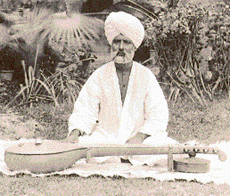 Inayat Khan also trained Noor in music. The book refers to sufi influences on the life of Noor Inayat, who was inspired by patriotic fervour. It also talks of the Sufi Centre, which still exists in France. Once home to a splendid tradition, spearheaded by Mir Nasir Ahmad Beenkar and Saeen Ilyas, Kapurthala now bears negligible links to its glorious past. Anita Singh nostalgically remarks, "Most of the musicians, including Tufail Niazi and Ata Muhammad, went to Pakistan. Other great musicians of Kapurthala like Pt Ghannaya Lal, Pt Nathuram, Shankar Das and Murari Lal are also now no longer remembered. In our own times, Tufail Niazi, who belongs to the Kapurthala music tradition and to the lineage of Saeen Ilyas, became an internationally renowned musician. Mahant Gajja Singh, who later became the sangeet guru of Maharaja Bhupinder Singh of Patiala, also learnt from Mir Rehmat Ali, son of Mir Nasir Ahmad. Bhai Ata Muhammad’s son Bhai Lal and grandson Ghulam Hassan Shaggan went on to enrich the tradition with their music contributions." Interestingly, Ghulam Hassan Shaggan’s grandfather Bhai Ata Muhammad was a disciple of Mian Bannay Khan of Gwalior Gharana, who was responsible for introducing khayal to Punjab. Ghulam Hassan’s father Bhai Lal, after the death of Ata Muhammad, came under the influence of Mian Mahboob Ali, a great sitar player from Kapurthala Gharana. Despite being a sitar player, Mian Mehboob was familiar with vocal techniques and knew rare bandishes. Besides teaching Bhai Lal these bandishes, he taught him the techniques of meerkhand and moorchna. Ghulam Hassan imbibed music from his father Bhai Lal. Even as Kapurthala’s music history inspires us with awe, the loss of vital links to this glorious tradition remains a disturbing fact. While musicologists and the royalty alike fail to trace the factors that led to the loss of a tradition, you wonder what message the tomb of Mir Nasir Ahmad wishes to give to the world.